The BC stroker kit for the Mitsubishi 4G63 engine platform incorporates a 102mm stroke, 7 bolt crank. Depending on bore size that you decide, the BC kit will take you up to a 2.4L with 86mm bore. 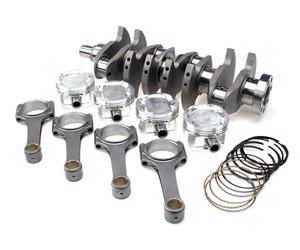 The 4G63 kit utilizes premium steel billet connecting rods. As usual, each BC kit features custom CP pistons, highest quality, steel alloy wrist pins, full ring pack and buttons. ProH2K rods are rated up to 600 maximum horsepower, Pro Series rods rated to 1000+ horsepower. BC 4340 billet steel crankshaft (102mm stroke). BC 4340 ProH2K or Pro Series connecting rods. Note: For LightWeight crank design, add "LW" to the end of the above stroker kit part number. $350 additional. Note: ACL Race Series Bearings are NOT included in this kit. For bearing information click here. BC connecting rods are CNC machined from aerospace grade 4340 steel billet, available in your choice of the European influenced H beam or the traditional I beam design (certain applications). All rods feature a deep, double ribbed cap that keeps the big end housing bore true at extended rpm and insures uniform bearing crush, delivering proper clearances for superior oil supply and maximum load carrying capacity. H Beam rods feature a deep radial groove pin bushing and oil holes at 5 and 7 o'clock (the beam acts as a trough), bringing critical lubrication to the critical wrist pin area. I Beam rods feature a oil hole at the 12 o'clock position that keep the pin end bore true at high boost. Available in your choice of ARP2000 fasteners (rated to 210,000 psi) or the ultimate faster, ARP's Custom Age 625+ (rated to 280,000 psi). Choose from the top piston brands available... CP or JE... in any desired bore size and compression ratio. Both brands make their custom BC stroker pistons from 2618 T6 high tensile strength forged aluminum forgings. These forgings are computer designed for strength and minimum weight. Each piston dia is CNC machined to assure optimal accuracy and superior grain flow in the forging process. 3D modeling software and rigorous Finite Element Analysis insure that your pistons are manufactured to the strongest and lightest part possible for your application. Your custom pistons feature tighter clearances, less noise, better ring seal and overall better durability. Standard features include pin fit, carbon steel wrist pins and spiral locks or rail supports depending on application. Added features include upgraded 9310 alloy wrist pins for reduced flex, lateral gas ports to assist in ring seal, skirt and top coatings and lightweight design.